“pulpcitizen” of Eclectic Gentlemen Tabletop Gamer and Pulp Citizen has been organising “Zomtober“. I decided to join in. All that taking part requires is that participants paint at least one zombie or survivor each week in October and blog about it. Four models, thats it. Tomorrow is the deadline for the first figure and this is mine. I havent painted a “proper” zombie since early 2011 when I burned out a bit painting a load of resurrected hospital patients. I figured that taking part in Zomtober would encourage me to paint a few miniatures that have been sitting around undercoated for a few years. 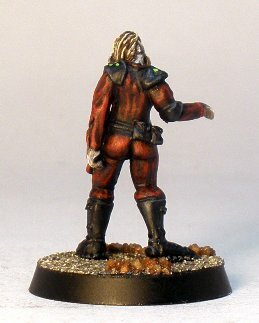 This figure is an Alpha Forge zombie from the Star Mogul game. I bought it from Mega Miniatures when they bought the line. Conceptually the zombie has been rendered dead-alive by some sort of alien process I think, but its a classic guts-hanging-out shambler all the same. I decided to quickly paint the figure in a red outfit just to see if I could make it work (I normally avoid red clothing on zombies because its usually present in gore of some sort). The miniature worked out fine: not my best but not my worst either. The photo worked out a little grainy too. Ho hum. My second Zomtober entry will go up at some point over the next week. Nice space zombie. Glad you have the zombie bug again. I have always liked your icky zombies. Thanks Rob. Im not sure how long the bug will last, but I will get to the end of Zomtober one way or another. Awesome sauce very nicely done! Thanks Brummie. Its a rank and file zed, but I enjoyed painting it all the same.